I met Kamini Pather a few years back after our paths crossed a few times in the industry. She eventually moved to Johannesburg after I had already been living here for a few years with my husband. We got along from the word go. I think it was because we both had a passion for food, our careers and we had a similar outlook on life – we understood one another. What I value most about Kamini is her quiet determination, her dedication to her craft and the way she is able to know her value and never compromise on that. This is what I struggle with, not allowing people to undervalue me and the example Kamini sets is an important skill I am trying to adopt everyday. I don’t think enough women do this – yet it is so important that we do. On an immediate level, breakfast. I always wake up an hour earlier than necessary because I hate rushing the start to my day. My morning routine includes 10minutes of stretching – it’s a great way to “check in” with myself. And then my coffee, which now includes 1Table spoon of MCT oil, followed by oats or eggs on toast. It’s a simple hack but eating the same thing for breakfast frees up the mental space for more important things. No day is the same for me. It depends on what I’m doing for that week which could include writing, TV or appearances/demonstrations. The only consistency is my workout routine, which really does keep me sane. Thanks to my mum, I’ve always lived a healthy life. Brown bread, no sugar in tea, no fizzy drinks or sweets (unless we were having guests over) – that kinda thing. I’ve also always been a sporty person. I always played sport at school and figured skated competitively well into my teens. I really loved the feeling of competing, which meant that fitness was a by-product of simply having fun. This is the idea that I have carried into adulthood. She who eats, must run – what I’ve been saying to anyone who asks. TV and food are a tricky combination because one includes an amount of gluttony, while the other is riddled with emaciated figurines. 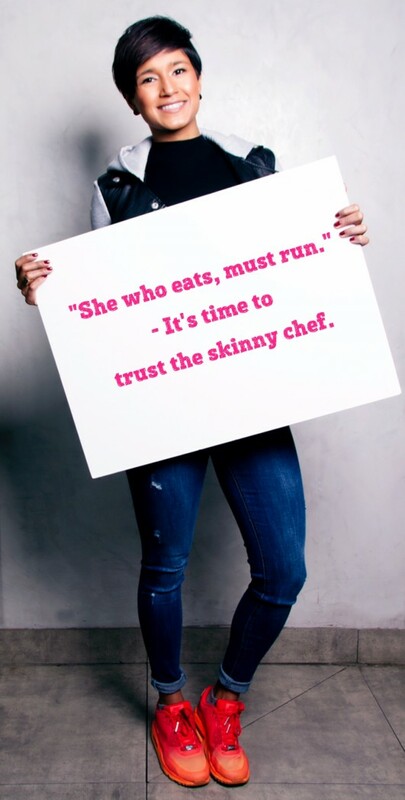 Besides that, the days of never trusting a skinny chef are over. Fitness and overall health are priorities for me because it’s an investment in myself. My body is my vehicle from birth to death. Gotta keep the machine well oiled. As I said earlier, exercise keeps me sane. It’s MY time – I have been known to sever limbs of random guys at the gym who attempt to get fresh. IT’S MY TIME! Right now I am obsessed with running. 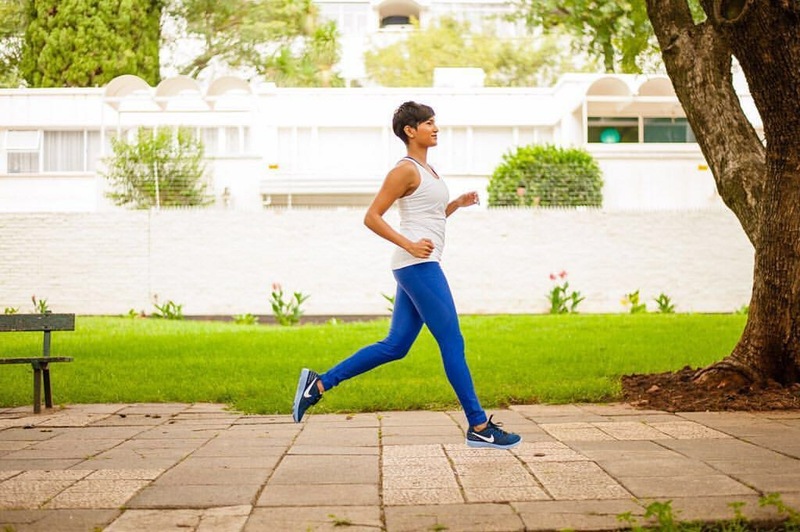 I only started running 5 years ago and have just signed up to run the Sanlam CT Marathon. 42.2km is no walk in the park but my training is going well – I’m aiming for a sub 5 hours. I love to run because I’m bad at meditation – my monkey mind rules supreme. Getting into a rhythm of breathing, stride and arm movement is entirely calming. In my opinion, there is no point of denying yourself a bowl of pasta or your grandmothers biriyani. Be conscious of your portion sizes and what time of day you enjoy that meal. Fad diets are not sustainable. Egg whites and spinach will get you that wash board physique quickly but no one can live that way. Rather make health and positive choices a lifestyle. Exercise is more effective when you enjoy it. If hitting the gym is not your vibe, if going for a run makes your insides furl, go to a dance class or join a rock climbing group – find your fun. Freshly baked bread is better than any cake on the planet! A rustic sourdough with a large bubbled structure and a visible slather of cold butter – heaven! Frozen Snickers Bars – are AHMAZING! The toffee shatters in your mouth. Stop what you’re doing and throw one into the freezer now. Thank me later. We need a woman in office. A female president of America is entirely possible right now. It’s just the start! Kamini dressed by Tally Weijl.